Marken’s BIOsystem box has been designed and engineered specifically for the transportation of frozen and controlled ambient biologics. As a global leader in supporting clinical trials through logistics planning and execution, our services include all elements of the clinical trial from API shipments to the handling of ultra-sensitive biologics. In shipping thousands of biologics in traditional shipping boxes, it became apparent that a more efficient box could be designed and engineered specifically for the transportation of frozen and controlled ambient biologics. Working with industry leading engineers, Marken’s CORTEC team delivered innovation. The resulting BIOsystem boxes obtain the perfect balance between payload and temperature control. The boxes have been globally qualified to the highest standards and the exclusive custom engineered solution achieves a new level of quality and sensitivity to global environmental issues. Validated to conform to ISTA 7E enhanced protocol and regionally IATA PI620 approved for the transport of biological specimens, the BIOsystem series has the slimmest carbon footprint on the market, with up to a 40% reduction over comparative solutions. This small footprint is achieved by reducing cardboard, styrene and dry ice consumption to volumetric payload ratios. BIOsystem boxes offer improved quality, reduced environmental impact and assured product integrity at the same cost of comparative solutions. There are three sizes of BIOsystem Boxes to provide optimum packing solutions for whatever volume of samples you need to ship. The three sizes also enable Marken to choose the right BIOsystem box to ensure that the temperature profile is maintained, based on the anticipated duration of the shipment. 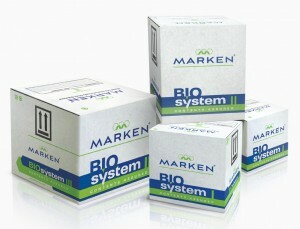 Currently, Marken’s BioSystem Boxes are designed for the distribution of frozen and Controlled Ambient products. However, regardless of the profile, Marken can help develop a custom service to support your clinical specimens and unique drug products.